To me, God was a “God of rules,” and we definitely didn’t have a relationship. 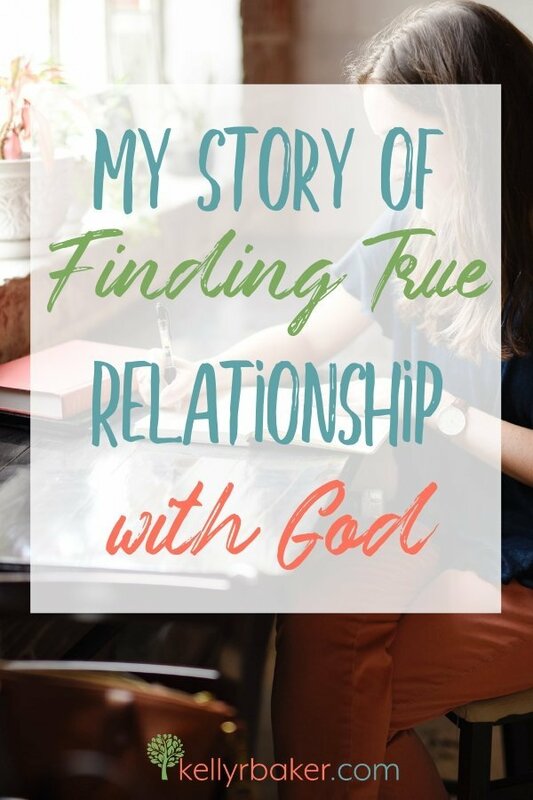 This is my story of finding true relationship with God. He was “my God” because He was my parents’ God; It was by default. My view of God was all about the God who would send me to hell if I didn’t do right. I grew up in the church since my dad has been a minister since before I was born but carried a rebellious nature with me. If I hadn’t been born to a dad who preached fiery repentance from the pulpit every Sunday—my life would have been a different story. I wanted to do what I wanted but was never allowed. Not with my parents. Not with God. I became angry with them both. I was a “good” kid growing up as far as spiritual appearances go. However, God looks not on the outward appearance, but on the heart. He looked at my heart, and found it given away to everyone but Him. I tried to find love and fulfillment through relationships with guys, but as soon as I knew a heart was hooked I moved on as if in a feeding frenzy. Although at age 18 God confirmed seven times that Justin was the one He had chosen for me, I was focused on his faults and decided I didn’t want to marry him. In short, I ditched him to wait for my ideal man: perfect with no faults. I had just thrown away part of God’s confirmed destiny for my life. Now what? I still followed God in my own way but wasn’t headed for my destiny in Him. The enemy continually lied that my parents and God rejected me. I reached 21 and tried to make a decision for myself. Being mad at God due to the misplaced view I had of Him, I stood outside my workplace one day and prayed a prayer I’ll never forget. Almost the next moment, an unfamiliar feeling arrived in my heart. An unrest had taken over my spirit. I tried to shake it, but it wouldn’t go away. It was worse than the conviction of the Holy Spirit. It was worse than the devil’s torment that God was going to make me do what He wanted instead of what I wanted. I went on with life, making wrong choices, and getting into a relationship with a man of the world. The feeling increased. I got off of work at midnight one night, and started driving home. The road took me up a hill that I couldn’t see over. At the top I was suddenly face to face with headlights. The car stopped mere inches from crashing into mine. I had walked out from under God’s protection, but I had a praying mother that kept me alive; she was on her second 40-days of targeted daily prayer and intermittent fasting for me. At that point, I knew what the feeling was. I had opened the door to a lot of demons, and I felt their evil presence. I was terrified, but I not only didn’t know how to fix my life, I wouldn’t. I knew God was real since I felt Him draw my heart to His at a service at the tender age of five. All I knew to do was to tell God I was sorry, and ask Jesus into my heart all over again so I wouldn’t go to hell. Yet, the 10,000 times I had done that my whole life hadn’t gotten me off the hamster wheel. A few weeks later, my mom asked to talk to me. I thought I was going to get a lecture, but agreed because her gentle demeanor intrigued me. A book had caught her eye while she was in the library, and she came to read it to me. I was an adult; it was a children’s book. She knew it seemed silly, but she pleaded softly to let her read it to me. The book was about a young animal talking to his mom. On each page the fuzzy little one asked if his parent would still love him if he made a mistake from various scenarios. Without fail, the mom answered that she would love him anyway. Before the end of the book we were both crying. My mom said, “Even if you never came back to God, I would still love you. Even if you married this guy, I would still love you. Even if you didn’t love me, I would still love you. And God would still love you, too.” She did not lecture me or try to convince me that I was wrong; she just loved. My heart reached a revelation that afternoon. God wouldn’t force me to love Him. He would still love me if I rejected Him. For the first time, I understood selfless love. It was the most gentle healing I have ever experienced. My mother’s praying and fasting enabled my deliverance to take place. That night I got out of the relationship. The following Sunday I gave my life back to God, but for the first time I yielded my whole heart to Him. At the altar that day, my dad was quietly dismissing the demons that had taken residence in my life. I quickly noticed I had peace again. In the weeks that followed, I discovered that God wanted a relationship with me, not a rule-keeping ritual. I learned how to be loved by Him because my view had lined up to what was true. Soon after, I discovered that Love satisfies. It still does. Looking to find a relationship with God? Read This If You Feel Meaningless to God. I love your story! Thanks for sharing. It also gives me hope as I raise my children, that my prayers do make a difference. Amazing testimony, Kelly! Thank you for sharing so bravely! I hope it brings others to Jesus! Wow, Kelly. Some of the similarities in our stories are fascinating! I too was 5 years old.. I wish that I would had the opportunity to be with the Proverbs 31 woman I met at 18. God knew I was not ready to be the Godly man she needed. We were engaged at 20, Broke up months later because I was focused on earning enough money for us. She proposed living with her family, when I said no, that was the beginning of the end. I moved away 5 years later. Thank you for sharing your beautiful, inspiring testimony. I thoroughly enjoyed reading. Have a wonderful week dear friend and may God continue to bless you and yours. Be well. Yes, so many similarities! I’m sorry it didn’t work out with her. I pray many blessings on you and your ministry, friend! What an incredible testimony! I read this and I’m blown away by God’s goodness and how He redeems is. Your story is powerful and I’m sure it resonates with many. Thank you for sharing such a pivotal moment in your life. He is so good! I was tearing up just before publishing. Thank you for your testimony & for your courage to share! This is beautiful Kelly. So glad you shared your story. God always waits for us to love Him back. When we open the door, there He is standing. Yes! I love it that He pursues us continually! This is such a powerful testimony, Kelly! I actually have a friend whose 15 yo daughter is rejecting God. She’s doing so for some of the same reasons you did–because she wants to choose her own beliefs, rather than adopting her parent’s faith. I’ll be sharing this with her (as well as pinning and tweeting). I’m so glad you found your way back to God. I’m praying your story makes a huge difference for all the prodigals out there! Oh, I’ll pray for her! And for her mother! Thank you for sharing with your friend. May God bring it to whoever needs to see it. Beautiful testimony! I’d so love to sit with you over coffee some day… Seems we have quite a bit in common! Blessings! Hi Kelly, I loved this! Such a powerful testimony of God’s love and care – and patience. Thank you for sharing your story! As much of your writing as I have read, I think this is the first time I’ve encountered your story! There is so much hope here for parents of prodigals and also for those who feel as if they’ve gone to far from God ever to be forgiven! As I prepared this post, I was reminded of His great love for us. Prodigals and all. Have a great day, friend! I gave this same book to my daughter, Erin, when she was about eighteen. Your testimony gives hope to moms whose children walk away from God. Thank you for sharing your story. Wow that is so interesting! God is using that book! Always share your testimony when God leads because you never know how God will use it. Stay blessed! Beautiful testimony my sweet friend!!! One day, I pray maybe God will allow you to share more in-depth on hearing him in the relationships department? Gorgeous pictures and thanks for sharing so freely with us. Praise God for your mama! It’s on the schedule for later in the year! 🙂 God is good and prayer is powerful! Kelly, thank you so much for sharing your testimony. You are giving hope to countless moms and dads who are praying and fasting for their children. And you are giving glory to God who pursues us relentlessly with His selfless perfect love. Blessings and hugs!! As long as it’s helping someone. That’s what it’s all about, right? Stay blessed, friend!